Kermani, Faiz. 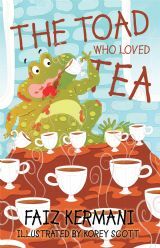 The Toad Who Loved Tea. Kibworth Beauchamp, Leicestershire: Matador, 2018. Tungtang the Toad sets off from Muddy River to town where she discovers a tea shop and discovers she loves it and can't get enough of it. However, the tea shop receives complaints because of muddy tables, missing tea, and missing pastries. Will the owners figure out what is happening? Will the toad continue to enjoy tea? You'll need to read this delightful book for children to find out. I received an advance electronic copy from the publisher through NetGalley with expectations of an honest review in exchange. Guterson, Ben. Winterhouse. Illustrated by Chloe Bristol. New York: Holt Books for Young Readers, 2018. Orphan Elizabeth Somers stays lives with her impoverished aunt and uncle. She loves books and puzzles, especially word puzzles. When they announce vacation plans for themselves and a stay at a grand house called Winterhouse for her, she wonders who paid for it. On the train she meets some creepy people who get off at the same stop and go to the same house. They cause problems from the moment they set foot in the door. Elizabeth soon meets the owner of the home who welcomes her. Elizabeth loves puzzles and helps a couple of men place a piece in what must be one of the largest and most challenging jigsaws of all time. She possesses a "magic touch" where when things "seem right" she feels it. She meets a boy about her age who has come alone to Winterhouse for several years and works on a scientific project for the owner. She loves books and libraries and finds a very interesting book in the reference collection she takes to her room for further study, even though she knows she should not. The house contains many puzzles begging for solution. This book will entertain readers in upper elementary to early middle school grades. Readers will want a few word puzzles of their own so parents (and teachers) should prepare for this outcome. The book creates a springboard to discuss good versus evil. I received an advance electronic copy of the book through NetGalley with the expectation of writing an unbiased review.